Chateau La Mer in Lindenshurst is the perfect waterfront location to enjoy Easter Sunday with the family. Chateua Le Mer is offering a buffet with a mangnificent array of delicious hot and cold stations featuting assorted salads, pastas, seafood, carving stations and desserts for $42.95 per person and half price for children under 10. Seating is available from noon to 3:30 p.m. Call for resrvations, 631.225.0400. Bring the whole family for an Easter celebration with Captain Lou Fleet aboard the Sapphire Princessin Freeport. The onboard brunch buffet (starting at 10 a.m.-1 p.m.) includes mimosas and bloody mary’s, while the lunch buffet (starting during the 2 p.m. seating to 5 p.m.) will include beer and wine. An easter egg hunt, meet and greet with the Easter Bunny and DJ entertainemnt will also be included. For more information and to rederve your table, visit here. Celebrate Easter Sunday at the beautiful Fox Hollow. Choose from their noted Easter Buffet, which includes photos with the Easter Bunny or dine in at the elegant restaurant on premise, Volpe. Seatings start at 11:30 a.m. Adults are $64.95 and children are $34.95. For full menus and to reserve your table for both Easter Brunch or Volpe, visit here. Easter Sunday brunch at the Watermill in Smithtown is the perfect spot for enjoying time with the family. With seatings starting at 10:30 a.m.-5:15 p.m. Brunch will include a visit with the Easter Bunny himself! Adults can dine for $65 and children $35. To reserve your table and for the full brunch menu, visit here. Mirabelle in Stony Brook is the perfect spot for those looking for a relaxing Easter Sunday meal. The French bistro style restaurant will have an Easter brunch buffet with everything from a prime rib carving station to French toast and lobster and potato salad. We recommend reserving a booth, the comfy seating will make you feel like you’re dining in the countryside. Brunch will be served from 11 a.m.-6 p.m. Call for reservations, 631-751-0555. Summer may still be a couple months away, but Wave in Port Jefferson always offers stunning waterfront views and a spectacular lunch. With omelet and carving stations, assorted cheeses and hot and cold entrees, there is something for everyone. Make sure to save lots of room for their impressive dessert station and a special bunny will be making a surprise visit too! Wave will be offering a selection of different seatings, reservations are required and can be made by calling 631-921-5200. 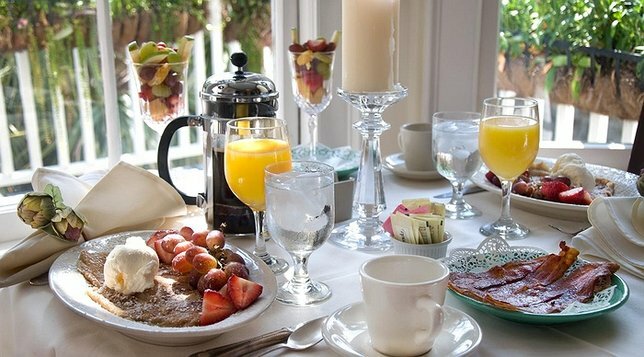 Diners can overlook the peaceful Great South Bay as they feast on Easter brunch. Pick from their carving station, which will include honey baked Virginia ham, or have a breakfast entrée of vegetable quiche. Lunch and salad options will be available too as well as a dessert station. Unlimited sipping is available with choices like mimosas, Bloody Marys, coffee, tea, soda and juice. Reservations can be made by calling 631-589-0022. The annual Easter brunch will have an omelet, salad and carving station along with an array of breakfast items, including French toast and home fries, and lunch items like herb crusted tilapia. The dining room overlooking the Nissequogue River is lined with white table cloths and decorative flowers, making it the perfect place to take that special someone. You name it, Lombardi’s will have it: omelets, antipasto, salad, pasta, an all you can eat shrimp bar and unlimited mimosas. Guests can indulge in breakfast, lunch, dinner and dessert choices all in one sitting. There will also be a Kid’s Bunny Station serving mac & cheese, chicken fingers and French fries. Seatings begin at 11 a.m. Call to make your reservation today, 631-471-6609. Sandbar is ideal for the crowd that may want to sleep in a bit (as long as you make a reservation). Sandbar offers a three course prix fixe menu for $65 per person with starters like their famous chickpea fries, duck tacos and entrees ranging from fresh seafood to rack of lamb. Dessert is also served (we recommend going for the milk and cookie). Offered from 12-8 p.m., guests can make a reservation by calling 631-498-6188. This rustic, new American cafe dishes out top-notch brunches every weekend, and Easter will be no different. Served from 10 a.m.-1:30 p.m., prepare for smoked salmon benedict, challah French toast, crispy calamari, homemade papardelle and a crispy jumbo-lump crab cake burgers. Reservations are required, visit here. Brunch with a view? Now thats how to celebrate Easter Sunday. Enjoy water views as you dine on signature brunch dishes like steak and eggs, eggs benny and brioche French toast. And for those looking for something a bit more lunch inspired go for their Cardoon signature burger, house made falafel or fresh baked fritattas. Reservations are required, call 516-785-2390 to reserve your table. Smithtown Restaurants are Serving Up Specials! Subject: LongIsland.com - Your Name sent you Article details of "Reserve Your Table at These Long Island Easter Brunches"